Most modern mobile devices connect to a charger with a standard MicroUSB cable, and if you use them as often as I use mine your cables probably become frayed and worn out pretty quick. The typical MicroUSB cable just wasn’t designed to withstand frequent use with multiple devices, but I recently had the opportunity to check out one that was. The awesome Anker PowerLine+ MicroUSB Cable was definitely designed with durability in mind. 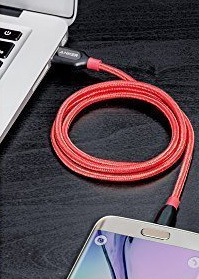 It has a double-braided nylon exterior, a toughened kevlar fiber core and reinforced stress points that allow this cable to last up to 10 times longer than typical MicroUSB cables. When I first picked up the Anker Powerline+ cable I immediately noticed how substantial it felt in my hand. It’s easy to see that this is no flimsy, thin cable that was designed and built just to barely get the job done. 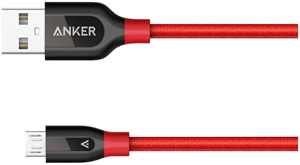 Bottom line: If you’re tired of replacing your MicroUSB charging cables every few months, I recommend that you give this little gem from Anker a try. It costs about the same as what you would pay for a flimsy one, and it’ll probably last you at least 10 times as long! Click here to read more about the awesome Anker PowerLine+ MicroUSB Cable at Amazon, including some of the almost 7,000 overwhelmingly positive user reviews.